Please note that this current website does not have a shopping cart. 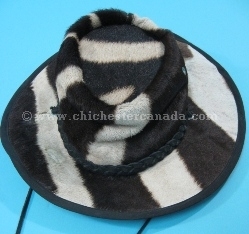 To buy our Zebra Hats online, please go to our e-commerce website at NaturalExotics.ca. These stylish hats are made using Burchell's zebra skins from South Africa. Burchell's zebra are not endangered and are quite common in the wild.